This is an interesting article about conceptualising the early modern and its different inflections, meaning and scope it received in the Anglophone and Non-Anglophone fields and contexts. A Fashion Meeting, an 18th Century Water-Colour for the Printed Gallerie des Modes, 1779. Ideas about metropolitan fashion spread more rapidly throughout the eighteenth century as travel became easier, communications improved, and the literate gained access to burgeoning illustrated periodicals. The travel time between Paris and Lyon, for example, halved from the ten-day journey of the seventeenth century to five days by the late-eighteenth (Sargenston 1996:103). The proliferation of detailed engravings permitted the rapid dissemination of fashionable ideals, spreading also the cult of individualism, novelty and possibly a new manner of discussing fashion. Printed sets of ‘modern habits’ depicting elegant dress and posture of men and women after French designs by Hubert-François Gravelot and Bernard Picart had circulated in the first four decades of the eighteenth century in England. Cheaper English Ladies ‘Pocket Books’ illustrated existing court and ‘de bon ton’ fashions in the 1760s, but the specialized fashion press first emerged in France in 1768 with the Journal du Goût and in England in 1770 with The Lady’s Magazine. Gallerie des modes et des costumes français (1778-1787) published seventy portfolios with detailed texts and engravings of breathtakingly variable dress for men and women, naming many of the suppliers. By the end of the century, more than fifteen fashion journals were printed in England, France, Holland, Germany and Italy, also providing details of seasonal changes in accessories, schemes of interior decoration, furniture, silver, ceramic and other luxury objects as well as regular coverage of carriage design. Silhouette group of Mr. and Mrs. Smith and Aunt Everard of Hailsham. On Friday 13th April 2012 a workshop was held at the V&A to discuss the possibilities and practicalities of The Assembly Activity Area that is intended to be a part of the new Europe 1600-1800 galleries. The Assembly is the provisional title for the third of three Activity Areas in the galleries (The Cabinet and The Salon being the first two), where the visitor experience will be different from that offered by the displays. The current plan is for the space to use digital technology to offer visitors the opportunity to participate in a 5-7 minute film, made in the style of 18th-century silhouettes. It will be a place where visitors can dress up, perform and have fun, but also gain an understanding of social behaviour of this period. The workshop had two central areas of focus: ‘Content’ – The space and its purpose, ideas for film narrative and title, the inclusion of music; ‘Practicalities’: the use of costume, film and music and how best to utilize new technologies. Participants included curatorial staff from the project, staff from our Education, Web and Theatre & Performance departments and Corinne Thepaut-Cabasset (HERA Post Doctoral Research Fellow). External specialists from different disciplines were also invited to stimulate discussion by speaking on one aspect of the delivery of the area. 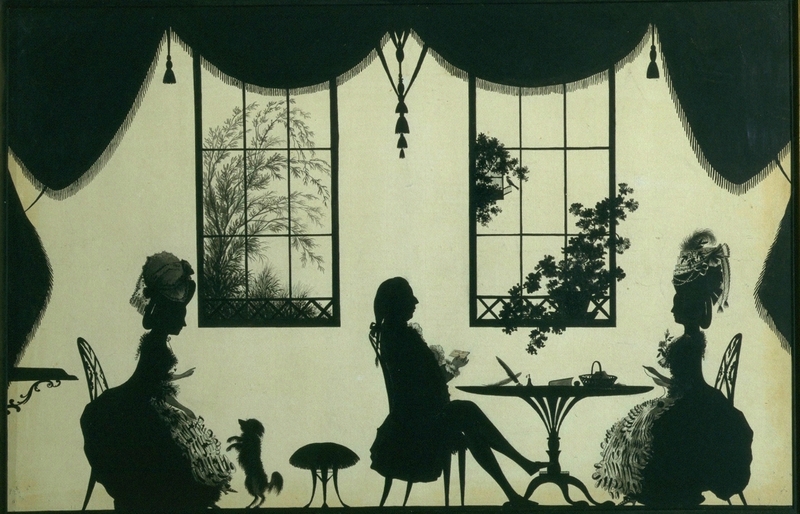 Dawn Hoskin and Nadine Langford (V&A) put the choice of a silhouette format for the film into context, providing a brief history of silhouettes and ‘shadowology’ and considering their popularity in the 18th century. Interesting links were made with the popularity of shadow puppetry, découpage and physiognomy. Johannes Pietsch (Bayerisches Museum, Munich), Patrik Steorn (University of Stockholm) and Pascale Gorguet-Ballesteros (Musée Galliera, Paris) each presented suggestions of what could be an effective narrative and reveal most about the use of fashion in this period. Pascale’s suggestion was to dramatise an entertaining conversation about fashion taking place in the Duchesse de Chartres’ sitting room, Palais Royal, Paris, 1784, giving details of the main milliners, chiefly Rose Bertin, her work, her relationships with Marie-Antoinette and her customers. Johannes suggested a narrative based on the toilette (preparing your appearance for going out in public), perhaps including the powdering of wigs etc. He highlighted the importance of the dissemination of fashion through prints, providing numerous examples of styles and terminology undergoing slight changes as fashions moved through different countries. The development of caricatures in relation to fashion prints was also discussed. Johannes also emphasised the importance of colour in fashionable clothing and asked how this could be conveyed within a silhouette production. Patrik provided an insight into the popularity of silhouettes in relation to famous personalities (e.g. dancers, composers, singers and actors) in late 18th-century Stockholm. He also used examples of fashion prints from Stockholms Posten to again demonstrate the role of prints in the dissemination of and commentary on fashions. The reappearance of M Darly’s ‘Ridiculous taste or the Ladies’ absurdities’ (1771) in different versions and media over time provided a strong illustration of this. Sophie Walpole and Nadine Langford (V&A) made a presentation on how we could make effective use of current and future technology, exploring ideas of how visitors could interact with the film and how music could be used. They explained the current move towards approaching the use of technology in terms of information being multi-platform, accessible using different devices and platforms (e.g. apps, web-links etc.). Examples were given of touch-screen panels and ‘dance karaoke’-type programs that can track visitors’ movements and how they may work for our purposes (including being able to provide ‘programmable silhouettes’). Adrian Deakes (V&A) talked about how to encourage audience participation. His key observations of people using ‘activity areas’ are that they need to indicate that visitors are invited to interact and what they will gain, be non-threatening, be layered (for young and old), work for groups, individuals, and as a passive audience activity. Adrian also spoke about the design, use, deterioration and replacement of costume in galleries. The use of costumes in galleries is problematic, with key issues being that costumes need to be robust and hard-wearing, should be available in different sizes, need to be maintained and cannot feature materials that aren’t allowed in the galleries (e.g. wool and leather) because of the danger of bug and pest infestation. Jenny Tiramani (The School of Historical Dress, London) spoke of her experience of the intellectual and practical challenges involved in creating reproduction costume for ‘dressing-up’. She felt very strongly about the importance of quality materials and construction, especially in terms of a costume ‘feeling authentic’ to the wearer. Jenny suggested that, instead of providing costumes for visitors, we should instead consider using visitor-operated dolls – ‘half size’ Pandora fashion dolls for visitors to dress in well-made costumes. This idea was very well-received and seems very promising as it is historically accurate as a concept (fashion dolls were used to showcase designs in the 18th-century). It would allow for high quality clothing to be produced and visitors would be able to get a more complete understanding of what getting dressed entailed in this period. Other interesting areas of discussion included how to convey the importance of bright colours in fashion, how to convey the value of clothing (e.g. how many outfits one person would own and how long they would be worn for), how to convey the importance of body language and posture and how to convey the dissemination of fashions throughout Europe. The 5th Fashioning the Early Modern Workshop with Rococo and Knitting Designers, conducted 13-14 June 2012 at the Carlsberg Academy, Copenhagen, Denmark, explored this question of past and present in terms of contemporary fashion design practice. Carefully brokered by Kirsten Toftegaard, Dr Maj G Ringgard and Prof. Marie-Louise Nosch as a two-day workshop event, it used Toftegaard’s concurrent exhibition Rokokomania (Designmuseum Danmark 2012) as the leitmotif for a series of conversations between thirty participants from many backgrounds and countries. A group of three fashion and textile designers (all women, interestingly) had been commissioned to create design ‘interventions’ that were integrated in the space of the Rococo show. They had been briefed concerning the curatorial intent and had had considerable time to work on the commissions, due to a delay in the timetabling of the show. This allowed the unusual possibility of much reflection, as well as their considered reaction to the show in the context of the HERA FEM Workshop. Smaller groups of FEM participants sat down for one hour with each designer to discuss and debate their design process and outcomes, providing an invaluable opportunity to test on this occasion if designers might make ‘use of (live) historians’ rather than general ‘uses of history’. On Day 2 we had the privilege to meet experts and designers of contemporary knitting, who also indicated the ‘uses of history’ for their practice. In the Scandinavian countries Norway, Sweden and Denmark, the museums own colourful garments made of worsted stuffs which in the 18th century was woven in Norwich, England, and exported to many parts of the world. London Metropolitan Archives hold the Foundling Textiles (Styles 2010) and with good guidance of John Styles I had the chance to see the few examples of mid 18th century worsteds among the silks and all the different kinds of printed cottons and linen. Printed fabrics are relevant for the research of Kirsten Toftegaard. At Victoria & Albert Museum I scrutinized the 18th century merchant John Kelly’s sample book of Norwich Stuffs from 1767 and pictures of the one from 1763. Furthermore we saw lengths of these fabrics in the storeroom and as an extra bonus our excellent host, Clare Browne, showed us Barbara Johnson’s scrapbook dated 1746-1822. In 1746 when the young Barbara was 17 years old and for the rest of her life until 1822 she made this scrapbook with samples of fabric for all her clothes and also with fashion prints. It is an extraordinary source of dress in the 18th century and I am sure that it would be of great interest for many readers if Victoria and Albert Museum could publish it in some form. Kirsten Toftegaard examined printed fabrics in the exhibitions at the V&A and at The National Archives at Kew I saw the oldest known examples of Norwich stuffs which in 1719 with other examples of fine fabrics produced in England were sent to the Commissioners of Trade and Plantations by the Weavers Company of London. I want to acknowledge Professor Evelyn Welch and Senior Curator Lesley Miller for the kind invitation and Research Professor John Styles and Curator Clare Browne for their great help and hospitality. Styles, John: Threads of Feeling. The London Foundling Hospital’s Textile Tokens, 1740-1770. 2010. Nikoline Liv Andersen, Laura Baruël and Anne Damgaard. The exhibition is on show until 23 September 2012. Jointly organised by: University of Uppsala, Stockholm University, K. A. Almgren Sidenväveri & Museum and the Nordiska Museet. The 2012 Pasold conference will consider the dynamics of change and innovation within the production, trade, retailing and consumption of textiles and clothing in the period before the nineteenth century. This requires an understanding of the history of making cloth and clothes, of the training and organization of labour, and of the relative value of technical and conceptual skills. The conference aims to reflect on product as well as process innovation, invention, changes in design and more general shifts in the politics of production (for instance, the nature of the guilds, notions of quality and value) and also consumption (for example, the gendering of cloth and clothing; access to markets and mindsets). This conference seeks to explore how our understanding of early modern global connections changes if we consider the role material culture played in shaping such connections. In what ways did material objects participate in the development of the multiple processes often referred to as ‘globalisation’? How did objects contribute to the construction of such notions as hybridism and cosmopolitanism? What was their role in trade and migration, gifts and diplomacy, encounters and conflict? What kind of geographies did they create in the early modern world? What was their cultural value vis-à-vis their economic value? In short, we seek to explore the ways in which commodities and connections intersected in the early modern world. Papers should be no more than twenty minutes long. Where possible we welcome proposals for sessions of three or four papers. To submit a proposal, please send a 200-word abstract of the proposed paper, together with a one page CV, to: ghcc.conferences@warwick.ac.uk, Global History and Culture Centre, Department of History, University of Warwick, Coventry CV4 7AL, UK. The closing date for proposals is 1 June 2012. Successful candidates will be notified by the 1 July 2012.